Belgium, which has seen its deeply-rooted radical Islamic nature exposed by the attacks in Paris and Brussels, thinks it has the answer to the phenomenon of Islamic radicalization. The Muslim Executive of Belgium placed an ad seeking counselors to deradicalize inmates. The advertisement lists the following qualifications, looking for candidates with "sufficient religious knowledge" and a "resistance to stress." In European city after city – Brussels, Copenhagen, Paris, Toulouse – we have seen innocent civilians – men, women, and children – maimed or killed by people who were radicalized. Now we know that many of the terrorists were radicalized while serving time in prison for petty offenses. It was in the cauldron of the penitentiary that they were exposed to radical Islamic terrorists as well as to literature and clergy that facilitated their transition from crook to jihadist. The United States is not immune to this disease. In Chattanooga, Garland, Texas, New York City, Philadelphia, San Bernardino and elsewhere individuals who had become radicalized committed attacks and murder in the name of Allah. Authorities know that the journey to Islamic radicalization may take many paths including social media, videos, literature, or a charismatic facilitator. But the end result is always the same. It produces people who are willing to kill anyone, including themselves, while thinking they are pleasing God. False promises of virgins and paradise spur them on. Those who are captured or arrested are confined. They are removed from society, however no effective program has been found to undo the radicalization process to which they succumbed. A program that seeks to hire more "religious counselors" certainly would not be a realistic solution in the United States. 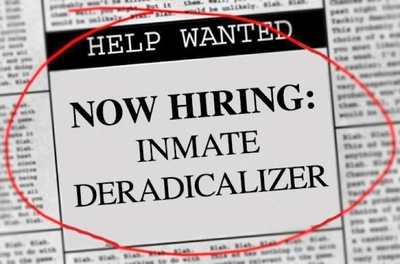 We have yet to find an adequate way to vet Islamic clergy applying for positions in the U.S. Bureau of Prisons even though the Inspector General for the Department of Justice in 2004 stated it was necessary to thwart prison radicalization. Recently, it was discovered that a radical imam, Fouad El Bayly, was working as a chaplain at Maryland's Cumberland Federal Correctional Institution. In 2007, El Bayly publicly called Somali-born activist Ayaan Hirsi Ali an apostate who deserved death. Minneapolis has seen a fair share of Islamic radicalization among its Somali youth. Numerous Somali American young men have left the U.S. to join Al Shabaab and the Islamic State after being exposed to radical Islamic teachings through social media and videos. In an effort to deal with the problem of the radicalization of as many as 10 people recently arrested for attempting to provide material support to a terrorist organization, Minnesota U.S. District Judge Michael Davis has devised a deradicalization program that includes hiring researcher Daniel Koehler, who has dealt with the neo-Nazi movement in Germany, to provide counseling and training for both inmates and staff. The program has already met with criticism from both law enforcement and civil rights activists. Law enforcement officials point to the first inmate, Abdullahi Yusuf, as a sign of the program's potential danger. Yusuf was arrested in 2014 when he attempted to board a flight to Turkey to join ISIS and fight in Syria. While awaiting trial, he was admitted to the program for deradicalization counseling and was allowed to stay in a halfway house instead of in jail. Less than four months later he was removed from the program after he was found with a box cutter. The 9/11 attacks proved how devastating the tool can be in the hands of a terrorist. Further resistance to the judge's deradicalization program came from the defense attorney appointed to represent Adan Abdihamid Farah. Farah was arrested last year when he attempted to travel to Syria and fight alongside other Islamic State jihadists. "If the deradicalization is for him (Farah) to moderate his religious beliefs, I can't do that," defense attorney Kenneth Udoibok told the Wall Street Journal. Law enforcement officials are concerned that any government program designed to modify an individual's religious belief system, no matter how well intentioned, would run afoul of the First Amendment protection of religious freedom. It could open up prison officials to litigation filed under the Religious Freedom Restoration Act. Absent modifying someone's radical Islamic beliefs, the program is left with offering job training, educational programs, psychological therapy, or family counseling. All of these options have been in the correctional environment for decades. Even with those programs, the recidivism rate exceeds 65 percent. One of the more successful counter terrorism programs has come under attack is the use of undercover agents to infiltrate terrorist conspiracies. Groups like the ACLU and the Council on American-Islamic Relations (CAIR) have criticized it as "entrapment." This position is simply wrong. attacks are carried out. Providing an opportunity for someone predisposed to commit a crime is not entrapment. While social programs may be designed to compete for the same young, impressionable minds and counter the allure that experienced Islamic extremist groups utilized in recruitment, we must insist that authorities not back away from their primary responsibility in the fight against terrorism. It is a war, and it will not be over until groups like ISIS and al-Qaida are taken out. Teach that faith and/or believing is not actual knowing. No one has ever proven or didproven s God. All the different gods man has Faith in don;t add up to being the real God. Illustrating that no religion has KNOWLEDGE of the of they believe in. Just study and discuss the laws that is attributed to being handed down. Then wonder why any God needs a book when all he has to do is putthem in your brain. This is jus a few ideas to teach in schools certifide to teach. ah, yes, Obama appointed progressive judges who support the fantasy of 'moderate' Islam. Trump will appoint judges who perceive Islam as it actually is - an ideology driven by its book of hate speech, the Koran. What we see happening is happening because islam dictates it. I'm amazed, 1400+ years history of islam and it's followers, using war and invasion techniques that are taught to them in the book from hell, the quran and still "extremists" are blamed , not islam. The time will come that the truth is finally embraced by all non islamic nations, I just hope it isn't too late. What comes next is that when their numbers are high enough in a host nation to undertake a full scale war, they will attack. This isn't a theory, it's a fact, one only need look at the history of muslims as they invade. But, by all means, continue on with the 'extremist' theory, in the end, all will regret this foolishness.